Now, that sounds like a mouthful isn't it? HAHAHA. Well, I was looking at my leftover bag of salted caramel chips after baking the Chocolate Lava Salted Caramel Chip Cookie and thought, what else can I make out of this? Well, actually you can make anything with salted caramel chips, really. But I was still craving for some half soft-half crunchy cookie, so well... let's go! This really CANNOT be any easier. First up, cream your butter and sugar until pale and fluffy, before beating in the egg, honey and vanilla extract. Sift in your dry ingredients (do not skip sifting as cocoa powder is always lumpy) and fold until most of the pockets of flour has disappeared, before folding in the salted caramel chips until just combined. Drop tablespoonful of your cookie batter onto a baking sheet lined with baking paper, space them about an inch apart. They do spread a bit, but not that much, so do press them down a little with wet hands if you prefer a flatter cookie. If you fancy, press in a few chunks of dark chocolate (or any chocolate you like) over the top of the flatten cookie and sprinkle some colourful sprinkles over the top before sending these cookies into the oven at 180 degree Celsius and bake them for about 15 to 18 minutes. 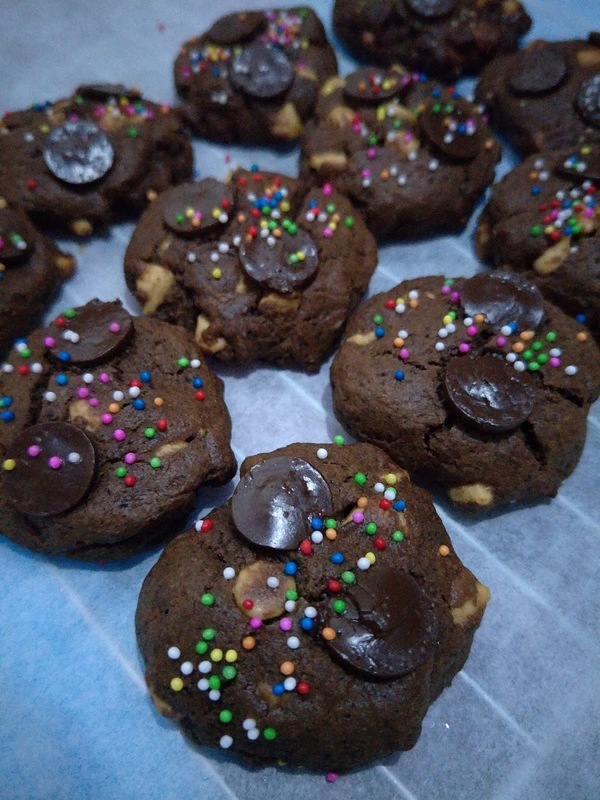 The sprinkles definitely added a nice, joyous touch to these cookies, which is slightly cakey and right smack in between a crunchy cookie and a soft cookie. YUMS!